U.S. President Donald Trump predicted Sunday there would be a resolution of the U.S.-China standoff on tariffs on hundreds of billions of dollars of goods the world's two biggest economies are threatening to impose on each other. The U.S. leader said, without offering any direct information, that "China will take down its Trade Barriers because it is the right thing to do." Trump said that "taxes will become Reciprocal & a deal will be made on Intellectual Property. Great future for both countries!" Regardless, Trump said that he and Chinese President Xi Jinping "will always be friends, no matter what happens with our dispute on trade." FILE - U.S. President Donald Trump China's President Xi Jinping arrive for the state dinner with the first ladies at the Great Hall of the People in Beijing, China, Nov. 9, 2017. 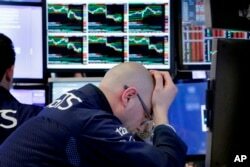 The threats Washington and Beijing have lobbed at each other in recent days have rattled world stock markets, with wide swings of hundreds of points in stock indexes. U.S. stocks plunged more than 2 percent Friday after Trump threatened to impose tariffs on an additional $100 billion worth of Chinese goods beyond the $50 billion worth of products he had already said would be affected. Specialist Mario Picone works at his post on the floor of the New York Stock Exchange, April 6, 2018. Stocks fell again as trade tensions grew between the U.S. and China. Beijing responded in kind, saying it would impose tariffs on U.S. goods "until the end at any cost." 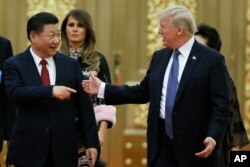 Both countries have published lists of goods they intend to tax, with the U.S. hitting steel and aluminum imports from China, along with aerospace, tech and machinery goods. Other levies would target medical equipment, medicine and educational materials. 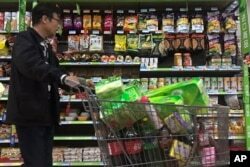 China said it would impose tariffs on more than 100 U.S. products, including soybeans, wheat, corn, beef, tobacco, vehicles, plastic products and an array of other items. FILE - A man pushes a shopping cart past a display of nuts imported from the United States and other countries at a supermarket in Beijing, April 2, 2018. U.S. Treasury Secretary Steven Mnuchin told CBS News that the threat of higher tariffs posed the risk of a trade war but that he does not expect one to materialize. "Our expectation is that we don't think there will be a trade war. Our objective is to continue to have discussions with China. I don't expect there will be a trade war. It could be, but I don't expect it at all," he said. Mnuchin said that Trump and Xi have a "very close relationship" and that the two countries would continue to discuss trade issues. A key U.S. lawmaker, Republican Sen. Lindsey Graham of South Carolina, told ABC News, that U.S. businesses and consumers could inevitably be hurt if China imposes tariffs on U.S. products. "There is no way for us to address China without absorbing some pain here," Graham said. "To those who believe that China is cheating, what idea do you have better than Trump?" Gary Hufbauer, a senior fellow at the Washington-based Peterson Institute for International Economics, told VOA that Trump and his top administration officials recognize that the tariffs from both sides would be "very damaging to both economies." "The short-term impact would be highly adverse," he said. "Both sides have a lot to gain by negotiations rather than actually implementing a tariff war."